Turkish President criticizes Obama over his silence following the killings of three young Muslims in North Carolina. Turkish President Recep Tayyip Erdogan on Thursday criticized U.S. President Barack Obama over his silence following the killings of three young Muslims in North Carolina this week, Reuters reported. Speaking alongside Mexican President Enrique Pena Nieto during a state visit to Mexico, Erdogan said the silence of Obama, Vice President Joe Biden and Secretary of State John Kerry was "telling" and they should take a position following such acts. "If you stay silent when faced with an incident like this, and don't make a statement, the world will stay silent towards you," Erdogan charged, according to Reuters. The three Muslims were shot dead on Tuesday near the University of North Carolina campus in an incident police said was possibly a hate crime. The White House said on Wednesday it would await the results of the police investigation before commenting. Erdogan has been in “attack mode” recently as he becomes increasingly outspoken about what he sees as rising Islamophobia in the West. In December, Erdogan slammed European countries for criticizing deteriorating press freedom in Turkey, saying they should instead try to find a solution for the increasing Islamophobia in Europe. Erdogan became president in August after more than a decade as prime minister, but the opposition accuses him of transforming the state by imposing a gradual Islamization and riding roughshod over democracy. Throughout his time in power there have been more signs of Turkey turning more extremist. In 2013, for example, the Turkish Parliament tightened restrictions on the sale and advertising of alcoholic beverages. A year earlier, a Turkish court formally charged internationally known pianist and composer Fazil Say with insulting Islamic religious values, in comments he made on Twitter. In December, Erdogan vowed to make lessons in the Arabic-alphabet Ottoman language compulsory in high schools, despite objections from secularists. 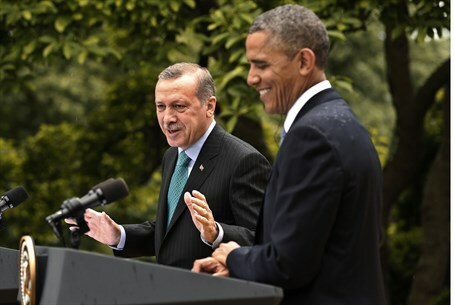 Last year, noted Reuters, Erdogan said his relations with Obama had become strained and that he no longer spoke directly with him as he was disappointed by a lack of U.S. action over the war in neighboring Syria. Erdogan said he instead spoke with Biden over issues such as Iraq. Washington, for its part, has been critical of Erdogan at times, particularly over his continuous verbal attacks on Israel, and has also expressed concern over the growing anti-Semitism in Turkey.